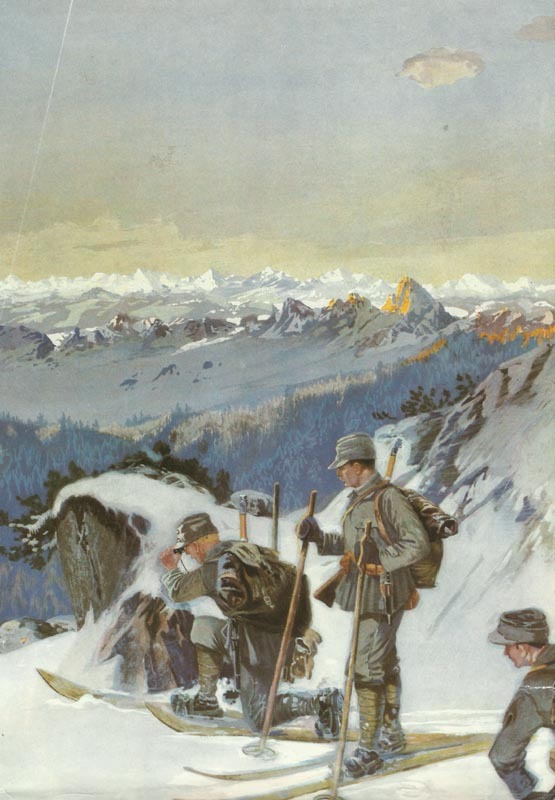 ‘Snowshoers Patrol’ on the Italian front. Italian Front: Italians attack and take Oslavia and Hill 188 (latter kept). Salonika: Sarrail sees Kitchener who tells him Joffre will not spare more troops (now 120,000 for this new theatre); British sending 3 more divisions. Serbia: Weather breaks with deluges and sudden floods on chronically muddy roads. British Cabinet’s War committee in Paris. French Army Senate committee insist on use of asphyxiat­ing gases. Galilpoli: Storms smash Anzac and West Beach piers (until next day).2 more divisions are going to Salonika on November 19. Channel – First British hospital ship sunk: Anglia (139 killed), sunk by mine of U-boat off Dover. Germany: Airship L18 burned out in shed at Tondern. Following day Navy airship SL6 destroyed in mid-air explosion (20 killed, no survivors). France: British War Cabinet arrives in Paris to discuss Gallipoli and aid to Serbia, approves Allied War Council in principle. Britain: 2nd 1915-16 Budget trebles beer duties.